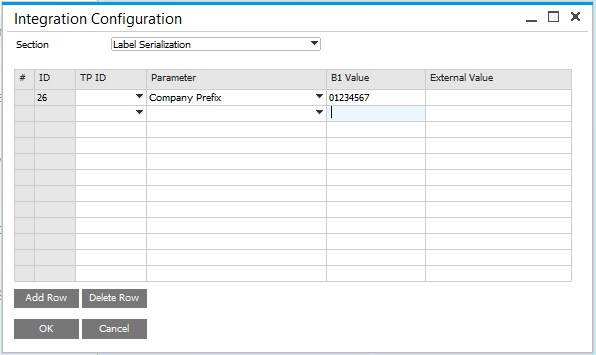 This configuration option is used to set the SSCC-18 Company Prefix and SSCC-18 Serial Sequencer for SPS Cloud EDI. These values are used to auto-generate SSCC-18 values in the Advanced Shipping Notice (ASN) form. For details on the SSCC-18 standard, refer to www.gs1-128.info/sscc-18/ . 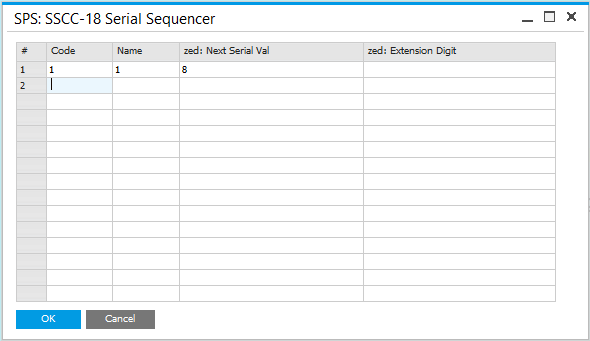 Map the company prefix for SSCC-18 auto-generation. COMPANY_PREFIX - Used to define the company prefix for SSCC-18/UCC-128 values for Advanced Shipping Notices (ASN). The B1 Value must be a 7-10 digit number, which will prefix all SSCC-18 assigned to ASN's. Must be unique, and should match the Name. Must be unique, and should match the Code. A 1-digit number, which may be left blank. This will be used in the auto-generation of the SSCC-18 values. If blank, 0 will be used. A 1, 2 or 3-digit number, which may be left blank. This will be used in the auto-generation of the SSCC-18 values. If blank, 000 will be used.